And it’s particularly true in this case because Facebook is the world’s second biggest advertising company in the world behind Google. During the last quarter of 2017, Facebook reported $12.97 billion in revenue, including $12.78 billion from ads. That’s 98.5 percent of Facebook’s revenue coming from ads. Ads aren’t necessarily a bad thing. But Facebook has reached ad saturation in the newsfeed. So the company has two options — creating new products and ad formats, or optimizing those sponsored posts. This isn’t a zero-sum game — Facebook has been doing both at the same time. That’s why you’re seeing more ads on Instagram and Messenger. And that’s also why ads on Facebook seem more relevant than ever. If Facebook can show you relevant ads and you end up clicking more often on those ads, then advertisers will pay Facebook more money. So Facebook has been collecting as much personal data about you as possible — it’s all about showing you the best ad. The company knows your interests, what you buy, where you go and who you’re sleeping with. Facebook’s terms and conditions are a giant lie. They are purposely misleading, too long and too broad. So you can’t just read the company’s terms of service and understand what it knows about you. In that archive file, you’ll find your photos, your posts, your events, etc. But if you keep digging, you’ll also find your private messages on Messenger (by default, nothing is encrypted). And if you keep digging a bit more, chances are you’ll also find your entire address book and even metadata about your SMS messages and phone calls. All of this is by design and you agreed to it. Facebook has unified terms of service and share user data across all its apps and services (except WhatsApp data in Europe for now). So if you follow a clothing brand on Instagram, you could see an ad from this brand on Facebook.com. But Facebook has also been using this trick quite a lot with Messenger. You might not remember, but the on-boarding experience on Messenger is really aggressive. On iOS, the app shows you a fake permission popup to access your address book that says “Ok” or “Learn More”. The company is using a fake popup because you can’t ask for permission twice. There’s a blinking arrow below the OK button. If you click on “Learn More”, you get a giant blue button that says “Turn On”. Everything about this screen is misleading and Messenger tries to manipulate your emotions. “Messenger only works when you have people to talk to,” it says. Nobody wants to be lonely, that’s why Facebook implies that turning on this option will give you friends. 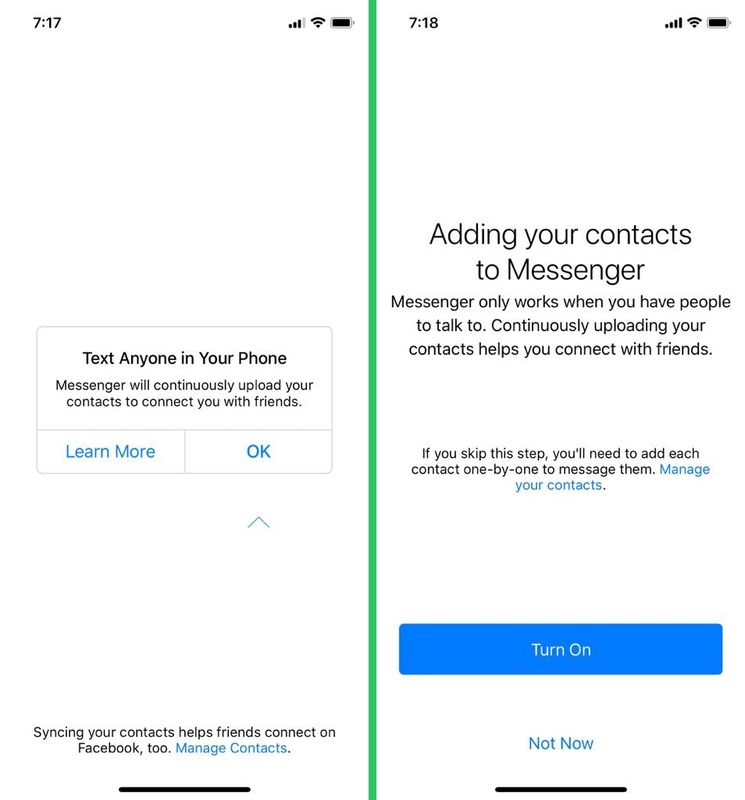 Even worse, it says “if you skip this step, you’ll need to add each contact one-by-one to message them.” This is simply a lie as you can automatically talk to your Facebook friends using Messenger without adding them one-by-one. If you tap on “Not Now”, Messenger will show you a fake notification every now and then to push you to enable contact syncing. If you tap on yes and disable it later, Facebook still keeps all your contacts on its servers. On Android, you can let Messenger manage your SMS messages. Of course, you guessed it, Facebook uploads all your metadata. Facebook knows who you’re texting, when, how often. Even if you disable it later, Facebook will keep this data for later reference. But my favorite thing is probably peer-to-peer payments. In some countries, you can pay back your friends using Messenger. It’s free! You just have to add your card to the app. It turns out that Facebook also buys data about your offline purchases. The next time you pay for a burrito with your credit card, Facebook will learn about this transaction and match this credit card number with the one you added in Messenger. In other words, Messenger is a great Trojan horse designed to learn everything about you. And the next time an app asks you to share your address book, there’s a 99-percent chance that this app is going to mine your address book to get new users, spam your friends, improve ad targeting and sell email addresses to marketing companies. I could say the same thing about all the other permission popups on your phone. Be careful when you install an app from the Play Store or open an app for the first time on iOS. It’s easier to enable something if a feature doesn’t work without it than to find out that Facebook knows everything about you. There’s one last hope. And that hope is GDPR. I encourage you to read TechCrunch’s Natasha Lomas excellent explanation of GDPR to understand what the European regulation is all about. Many of the misleading things that are currently happening at Facebook will have to change. You can’t force people to opt in like in Messenger. Data collection should be minimized to essential features. And Facebook will have to explain why it needs all this data to its users. If Facebook doesn’t comply, the company will have to pay up to 4 percent of its global annual turnover. But that doesn’t stop you from actively reclaiming your online privacy right now. You can’t be invisible on the internet, but you have to be conscious about what’s happening behind your back. Every time a company asks you to tap OK, think about what’s behind this popup. You can’t say that nobody told you. Dieser Eintrag wurde veröffentlicht in Corporate Culture, Social Media, Web Development, Werbung und getaggt mit Facebook, Facebook Scancal, GDPR, Stealing Data, Zuckerberg am 28. März 2018 von innovation.